Frontline Automation prides themselves on being able to provide the complete security solution, and that includes roller shutters. 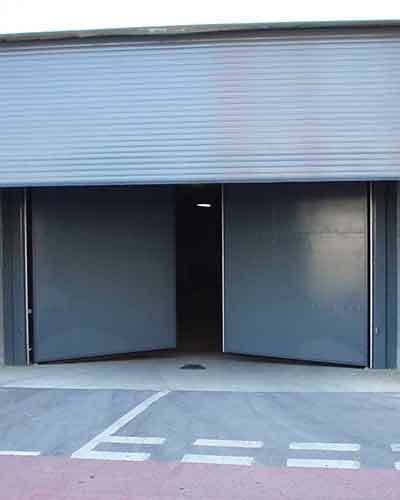 Roller Shutters are an extremely versatile product, and can be installed in a variety of sizes, meaning they are ideal for small, doorway security applications right up to entrances to car parks and huge superstore warehouses. The roller shutter will be built with interlocking sections, made from steel or aluminium. Depending on the material required, the finish can be selected from HP200 Plastisol Steel ranged colours or any Standard RAL Colour in either Syntha Pulvin or Powder Coated. The option of an insulated roller shutter may also be ideal, particularly if you are concerned about energy conservation or noise. There are a number of opening and access control options, including the ability to stop the door partway open/closed. Another option is an automated ‘up and over’ door will roll up and along the pitch of the ceiling directly above the opening, useful in warehouses where the full height of the doorway is required for access. The full requirements of the European Standard 13241-1 are met by these doors. Both options are also available as manual products and can be manually operated in the event of power failure. We can also provide & install insulated roller shutters. These shutters are useful in situations where energy conservation is key, as well as protection against the elements, noise and where a high level of security are priority.